This is a stunning new series of Hand Needle Felted Alpaca Art designed and executed by well respected fiber and leather artisan, Collins Griffith of Sandollar Alpacas. Entitled the Limited Edition Outdoors Design Series, only 10 pieces of each will be created and each will be signed and numbered. 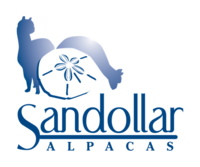 Each piece is made from 100% alpaca wool (suri and alpaca) harvested from Sandollar Alpacas own premium herd owned jointly by the artist and his wife, Nikki. The first design in the series, entitled Hunting in the Forest, showcases a single elk, seemingly on the lookout. 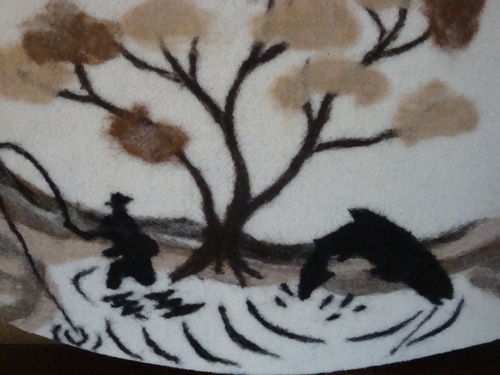 Using only natural alpaca wool colors, the artist highlights the beautiful whites, beiges, fawns and gray of the scene. 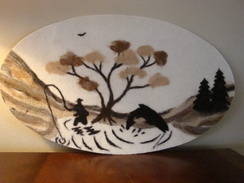 In the second design of the series Flyfishing in the Stream, a single fisherman is showcased with a catch on the line, and this time the tree is in full bloom and grays and blacks are included. The piece measures 35" wide by 21" high and is mounted on a board so that the piece hangs flat. It can be purchased as an oval with finished edges, or it can be purchased as a rectangle, with the edges unfinished for a more primitive look. It can also be purchased framed, call for details. The third and fourth designs are as yet incomplete. Order any single or the entire series. The pieces come suitable for framing or can be purchased already framed for an additional charge.